But first … what the hell is an f-stop? In photography terms, the f-stop is a camera lens aperture setting indicated by an f-number. The smaller the f-stop number, the bigger the lens opening—which seems counterintuitive, I know. For a beginning photographer, understanding that f/1.8 is way bigger than f/22 can be VERY confusing. F-stop also determines “depth of field”—you know how some photos are focused very tightly on the subject but then the background is fuzzy (also called “bokeh”)? That is depth of field. And in contemplating the next Eliza Gordon book, I felt that the idea of lens opening and depth of field were metaphors ready for their close-ups. I’ve done some photography, mostly as a hobbyist but then as a kids’ headshot and portrait photographer. While it was fun, I couldn’t commit the time or resources to getting REALLY good at it. And dealing with clients … any time you’re dealing with art, it’s tricky. Just like people asking me now for free books, a lot of parents had no problem in expecting I’d just hand over every single shot I’d taken. They didn’t realize that I was barely covering expenses by giving them such an affordable session fee. The camera and lenses and flashes (called speedlights, if you’re using Nikon), strobe lighting setups and softboxes and strobe umbrellas and backdrops and backdrop stands, plus my time to take the photos and then edit them later to erase their kid’s zits or bad dental habits? Yeah. Hug your next photographer. And if you or they are not a hugger, at least don’t be a jerk about their fees. Photography is an expensive, addictive pastime. There’s always a new camera coming out; there are always beautiful, fancy lenses calling your name. The trick is to find the camera body that works for your hand, your budget, your comfort level in terms of bells and whistles, and then find three core lenses that really achieve everything you want. My favorite is my 50mm prime lens—it’s called “prime” because it doesn’t have a zoom. It’s a fixed lens. BUT I get the sharpest images with that little sweetie. I use it for everything now. Enough about photography, Eliza. About the new book, or Why I Wrote Another Book at Revelation Cove That Wasn’t a Hollie-and-Ryan Story: First, don’t give up on me with those two. I’m sort of stuck on where I should drop them at the moment. But Frankie—her photographer dad calls her F-Stop—she just popped into my head one day while I was undoubtedly doing something less interesting than writing. (I get the best ideas while showering! Don’t you? Why IS that?) Frankie Hawes is a young woman who’s trying to figure out her place in the world as it relates to those who’ve come before her. Sounds like an Eliza book, right? Readers often ask writers if stories are autobiographical in any way—usually, less so than you think. I’m pretty sure your favorite thriller and horror writers aren’t sociopaths or serial killers. But my Eliza books usually have a stripe of me in there somewhere. I’ve worked at a hotel and then (very briefly) as a 911 operator (like Hollie Porter, Must Love Otters, Hollie Porter Builds a Raft); I’ve spent some time as a writer *wink* (Jayne Dandy, Neurotica); I am a failed actress who worked at an insurance company (Dani Steele, Dear Dwayne, With Love); and now with Francesca, I get to pull my photography background out of storage and give it a solid shake. I have a Super Awesome Up-and-Coming Project with a new publisher where the character is a housewife—something I know a little about, for better and for worse—though her other talents are something I only WISH I knew more about. 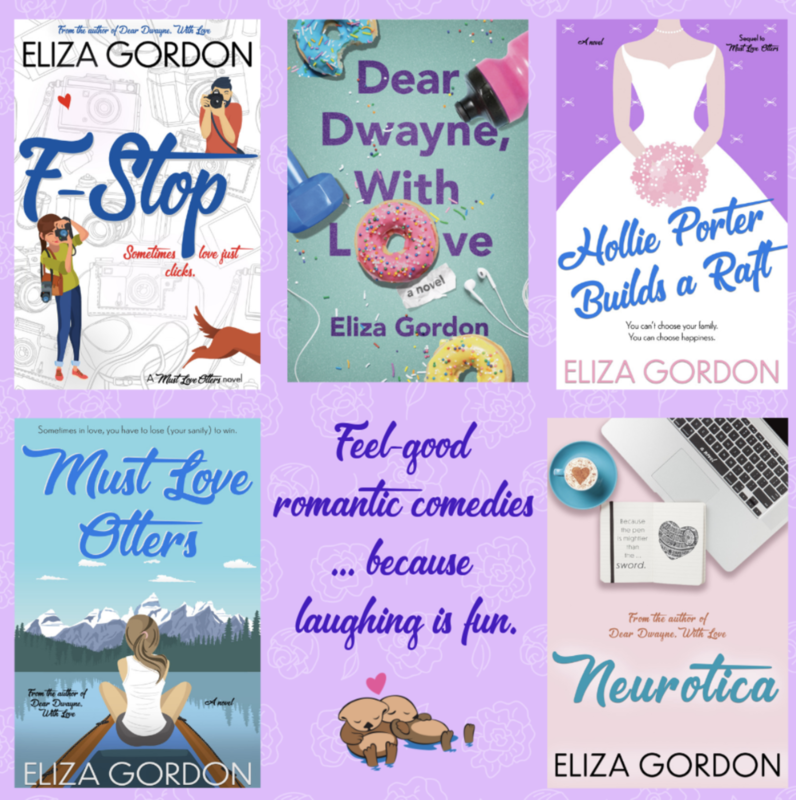 *hint hint* Then the next Eliza book after that will be set in a hospital (Wish Upon a Rosie), out in late 2019. Yes, I’ve also worked in a hospital. I hate that old adage that says “Write what you know,” so I try to find settings that I know a little about and then expand from there. Which is why I haven’t written the third Hollie and Ryan book yet. They need to go to Scotland. I haven’t quite made it there. Yet. But when I do, I’ll be sure to take my camera.